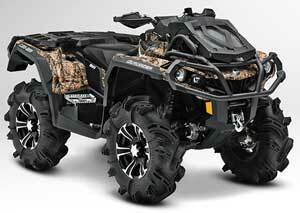 Can Am ATV Outlander Model Quick Overview. Can Am ATV Outlander - Quick Overview of All Models. 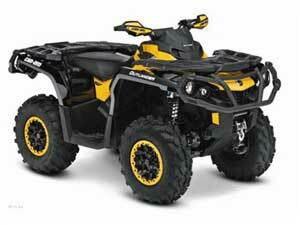 The Can Am ATV Outlander model line up seems to expand with every new model year. The Outlanders now include engine displacements from a single cylinder 400 to a 1000 V-twin. Added to that are several two passenger models with the Outlander Max designation. Then there are multiple option packages to choose from. We thought it was about time for a quick guide to make sorting through all the Can Am ATV Outlander models a little easier. You can quickly see the differences between models, which options are available on each model, the best purpose for the models, and more. So let's dive right in! Outlander 400 with XT package. 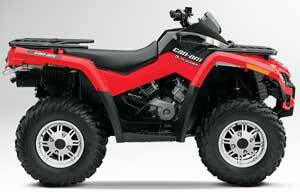 400 - The Outlander 400 is really a mid-size sport utility ATV. Even though it is an Outlander model, it has the most differences with the other models. The 400 still uses the first generation single rail frame, a McPherson strut front suspension, and a single cylinder engine. These features set it apart from the other Outlanders, as well as power steering not being offered. The 400 frame has a two inch shorter wheelbase and is the lightest Outlander model which make it a good choice for smaller or less experienced riders. You still get plenty with a liquid cooled and fuel injected engine, 4 wheel drive with an automatic locking front diff, disc brakes, 300 pound rack capacity, and 1,100 pound tow rating. A skid plate is now standard for better frame protection. Ride and handling are very good, and all this comes at a value price. 400 Max - A wheelbase 8 inches longer provides room enough to take a passenger or room for more storage. The 400 Rotax engine performs well, and has performance equal to most other 500 single cylinder ATVs. But the added weight of the Max is noticeable. With a passenger and a full load of gear, performance suffers quite a bit. 400 XT Package - The XT option for the Can Am ATV Outlander 400 includes 12 inch cast aluminum wheels with Carlisle 25" ACT radial tires, 3,000 pound Warn winch with remote control, heavy duty front and rear bumpers, and handlebar wind deflectors. 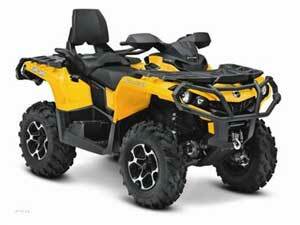 Specifications for Can Am ATV Outlander 400 models. 500 - The Outlander 500 gets the new second generation frame, including the now standard skid plate. The new frame has twin beams for more strength and lighter weight, instead of the older frames single beam. Front and rear suspension mounting points have been changed for better handling. Along with the new frame comes a revised air box for better engine breathing and easier maintenance. The Rotax V-twin engine remains the same, but does get a larger radiator for better cooling in all conditions. The 500 makes enough power, you can't really put it in the same class as other 500s, but closer to the bigger single cylinder ATVs. It gives up a little low end power but pulls strong through the mid and top range. Can Am's version of electric power steering is now an option for the 500, and combined with the manageable power, make for a very relaxing and easy to ride sport utility ATV. 500 Max - The Can Am ATV Outlander Max also gets the new design frame, and with an 8 inch longer wheelbase, gives you more room for a passenger or more stuff. If you decide to carry a heavy load, the 500 can start to feel a little sluggish due to the soft low end power. 650 - Like the 500, the Outlander 650 retains the same Rotax engine from previous models, but gets all the updated features. We have made no secret that the 650 is our favorite Outlander. It just strikes an almost perfect balance between power, handling, and rideability. The new frame and other new features just enhance the feeling of a well balanced utility ATV that can be ridden for sport and not get the feeling you are sacrificing anything. 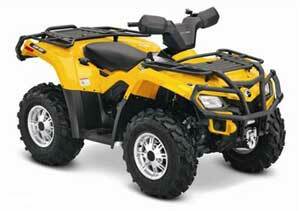 Add the power steering option, and the 650 is very tough to beat by any other sport utility 4 wheel drive ATV. 650 Max - All the features of the new Outlanders plus the extra length of the Max. The 650 has enough power to make the Max an attractive choice for those who want or need more room. Where the 500 could feel a little strained, the 650 doesn't. Sure, you can tell you have more weight, but it doesn't effect the performance nearly as much. 800 - 71 horsepower starts to sound like overkill in the Outlander 800. Admittedly, that's more power than almost anyone really needs, but it's nice to have when you want it. The better handling is welcome, but the 800 stretches the limits of the three disc brakes if you're trying to stop from higher speeds. Make no mistake, this is an ATV for very experienced riders. Things happen fast on the 800, both good and bad! 800 Max - We suppose the bigger Rotax 800 makes more sense on the Can Am ATV Outlander Max model. This is a case where you can put that extra power to good use with the heavier loads the Max is capable of carrying. 1000 - You can take everything we said about the 800R and add even more power (82 hp - to be exact). If you feel like you need the absolute ultimate sport utility ATV, we don't know of anything more ultimate than the 1000. Once again, given the power, weight, and potential speed of the Outlander 1000, lots of experience riding ATVs is a requirement. Some folks may not want to believe that, but this Can Am ATV Outlander demands the utmost in respect. 1000 Max - The power of the 1000 will let you laugh at any load you want to carry, even if it's straight up a mountain. Put on a passenger, 300 pounds on the racks, and tow 1,300 pounds without the big V-twin even breathing hard! 1000 XMR - The Can Am for ATV mudding, the Outlander XMR upgrades to the new Max chassis and 1000 Rotax V-twin for 2013. Also new for 2013 is optional Camo body panels. The XMR substitutes some practicality for better mudding capability by relocating the radiator to space normally occupied by the front rack. Even though the XMR is based on the extended Can Am ATV Outlander Max chassis, there is only seating for one. The extra length provides more stability in the mud and gives the rider more room to shift his weight for better traction. Gorilla Axles helped with the development and supplies heavier duty axles, 14 inch aluminum wheels and 30 inch Gorilla Silverback ATV mud tires. Other goodies include six way adjustable air shocks and power steering with three levels of assist. DPS - This new option package will get you the three position power steering and quick lock front diff, along with 12 inch aluminum wheels. Not offered on the Outlander 400. XT - The XT package for all but the Outlander 400 includes: Three level electric power steering, quicker locking front diff, 12 inch aluminum wheels with 26" Carlisle radial tires, heavy duty front and rear bumpers, and 3,000 pound Warn winch with wired remote control and special on board storage compartment. XT-P - Only available on the Outlander 800R and 1000. You get everything in the XT package plus Fox adjustable shocks and beadlock wheels. Specifications for Outlander 500, 650, 800R, and 1000 models.